How Many Episodes Does It Take to Get Hooked on a TV Show? 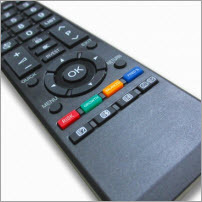 I have two young children, and I work full-time, so my adult TV time is about as rare as finding a Kardashian-free tabloid. So I can’t commit to just any TV show. It better be a good one. I was therefore extremely excited when Netflix analyzed viewer data to find out at what point watchers get hooked on the first season of various shows. Specifically, they identified the episode at which 70% of viewers who watched that episode went on to complete the entire first season. Translation for me: if I can tell early on if I’m going to like a show, I’m game. If the vast majority of viewers get hooked on The Walking Dead and all its zombie apocalypse gore-galore after just 2 episodes and I’m not feeling it by then, I’ll call it a day and move onto the next “it” show. Which shows get you hooked the fastest? Although there weren’t any shows where episode 1 was all it took—although I’m pretty sure Downton Abbey had me at the opening scene—there were many shows that came close. Bates Motel, Breaking Bad, Scandal, Sons of Anarchy, Suits, The Killing, and The Walking Dead tied for the No. 1 spot, each taking only 2 episodes until you’re hooked. Dexter, Gossip Girl, House of Cards, Marco Polo, Orange is the New Black, and Sense8 came in next at 3 episodes each. As for which shows take the longest, Arrow and How I Met Your Mother required the biggest level of commitment to get hooked, at 8 episodes. However, I noticed that both of these shows were similar in that they had some of the highest numbers of total episodes at 23 and 22, respectively. This got me thinking – does the total number of episodes have an impact on the number of episodes it takes someone to get hooked? Afraid of a Big Commitment, Anyone? 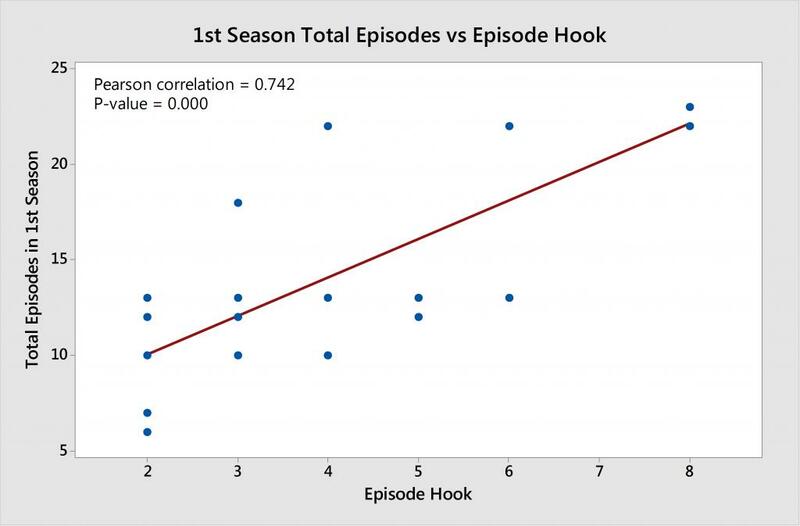 To see if the total number of episodes has an impact on the number of episodes until you’re hooked, I used Minitab Statistical Software to graph the total number of episodes in season 1 versus the episode hook number. I also ran the corresponding correlation test, which yielded a p-value of 0.000. Therefore, we can conclude that there is a statistically significant correlation between the two variables. 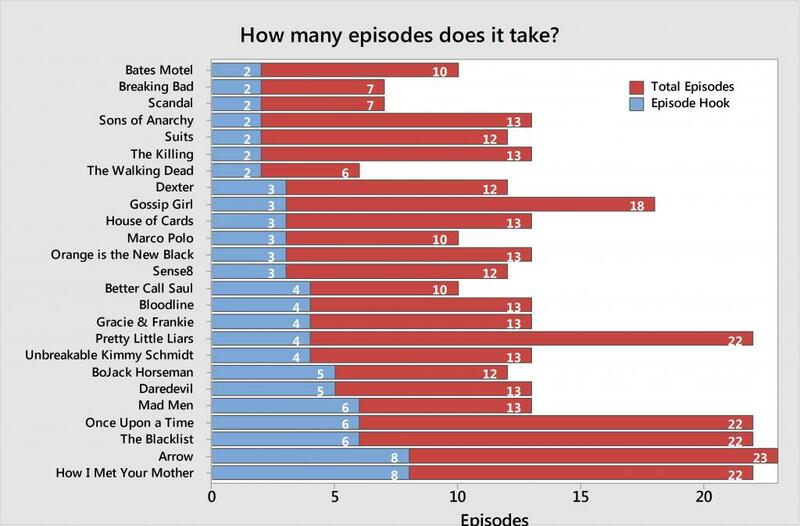 The more episodes in a season, the more episodes it takes until 70% of viewers complete the entire season. However, every good data analyst knows that correlation does not equal causation. So rather than presuming folks are less likely to make the commitment to view a long season, it could simply be due to the fact that the more episodes there are the greater the opportunity there is a for a person to bail on the series—thus taking longer to hit the 70% barometer that Netflix used for their study.